Featherweight Bent Trimmers 8" - GINGHER-Featherweight Dressmaker's Shears. Typical projects become light work with the Featherweight Dressmaker's Shears. These shears have a unique design and feel and weigh only 2 ounces. 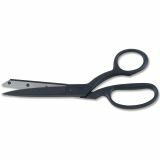 They feature durable, stainless steel blades and black nylon handles. This package contains one pair of 8 inch Featherweight Dressmaker's Shears. Caution: blades are extremely sharp. Handle with care. Imported.